Retail cleaning workers and other supporters of raising the state’s minimum wage march in silence through the Target downtown Minneapolis. 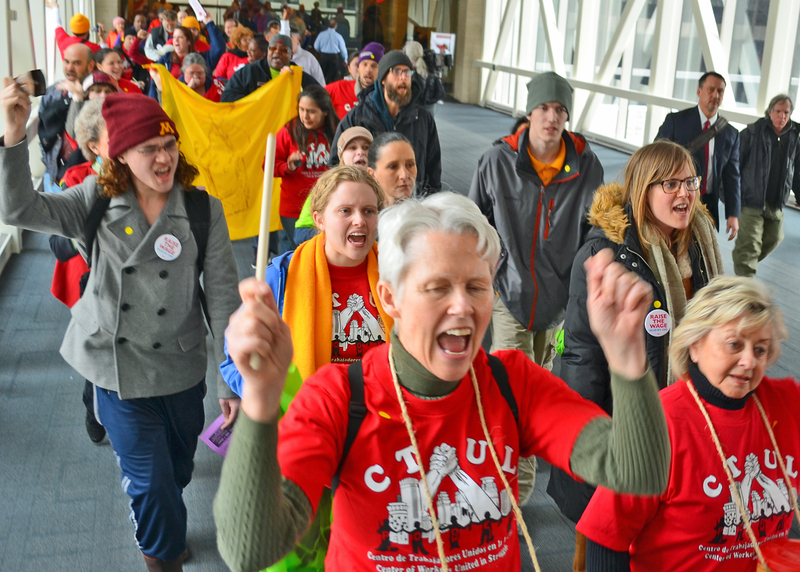 One day after a rally in support of raising Minnesota’s minimum wage rocked the Capitol rotunda, nearly 100 activists took their message to the skyways of Minneapolis, calling on Target and other corporations to join the fight against poverty wages. The lunch-hour march yesterday snaked through the skyways and into Target’s flagship store. Inside, demonstrators silenced their drums, noisemakers and chants and walked through the aisles with their fists raised in quiet solidarity. CTUL members lead a march through the Minneapolis skyway system and into Target’s flagship store. The Capitol rally and skyway march are part of a week of action in support of raising the state’s minimum wage to $9.50 by 2015 and indexing the wage to ensure it keeps pace with inflation. State lawmakers will begin hearings on a minimum-wage bill today, and activists intend to keep building momentum with events across the metro. Single mothers in Brooklyn Center will call on Walmart to back a wage hike today, and workers will rally against poverty wages at Minneapolis St. Paul International Airport tomorrow. “We talked to the Legislature yesterday, but we also know we need to talk to the corporations who are responsible for keeping wages as low as they are,” Veronica Mendez told activists before the skyway march. Mendez is an organizer with CTUL, the Twin Cities worker center that has given a voice to non-union workers employed by subcontractors to clean Target and other big-box stores. The workers say their wages have plunged and working conditions worsened in recent years, as Target cut costs by squeezing their employers, the cleaning contractors. Cabrera and other CTUL activists staged three strikes last year, erecting picket lines outside area Target stores. And for the last six weeks, CTUL members have been holding “Fair Wage Wednesday” demonstrations outside Target’s corporate headquarters. But cleaning workers aren’t the only ones who would benefit from a minimum-wage hike. The average pay for Target’s frontline staff ranges from $8.10 per hour for cashiers to $8.34 per hour for “team members” on the sales floor. And those wages come at a high cost to the state’s taxpayers, according to a report released last November. It estimates 5,850 Target workers in Minnesota access public assistance at an annual public cost of $44.7 million.